Last night was an odd one. We had a fabulous feast of hot pizzas from Hell Pizza, talked, and I got a text about buses and London and me (Tim nice but dim) thought it was about the first episode of the new Dr Who. But as I got home, my cellphone was going bananas and landline was ringing too. Bombs in London. Texted London buddies and all ok thank God. Today at work have been creating something slightly out of my range of knowledge and looked at the fantastico BBC site for ideas. And by the by came across a Blake’s Seven page. All hail Servalan. 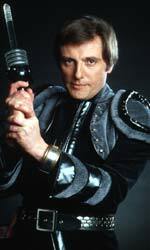 Actually I always had a thing for Avon (Paul Darrow) and his saturnine features and equally dark wit. And cor look at this!